In the early days of our blog (2015) we published an article on the diagnosis of pulmonary embolism in echo. Since then our audience has grown and additional research results have been published. This week we will review this past article and provide updates based on the latest studies. Pulmonary embolism is estimated to cause 60,000 – 100,00 deaths per year in the United States according to CDC statistics. Ten percent of symptomatic pulmonary emboli are fatal within one hour of symptoms onset. However, diagnosis can often be difficult because the presenting signs and symptoms are nonspecific and often mimic other cardiac and pulmonary diseases. Interventional strategies to remove or dissolve thrombi continue to improve. With these improvements, our ability to understand and diagnose also needs to improve. Echocardiography can aid in the diagnosis of pulmonary embolism and provides important functional information about the right and left ventricle that cannot be ascertained from other tests. The thrombus can form anywhere in the venous system and be visualized anywhere en route to the lungs (IVC, SVC, RA, RV, PA). Remember thrombi visualized proximal to PA are not diagnostic of PE but points to the process. There are also differential diagnosis of thrombi to keep in mind such as tumors or myxomas. A normal right ventricle (RV) is accustomed to very low pulmonary resistance. RV pressures are low and compliance is high. Unlike the left ventricle (LV), the right ventricle is not use to a lot of pressure or resistance and does a poor job at acutely responding to sudden increase in afterload. 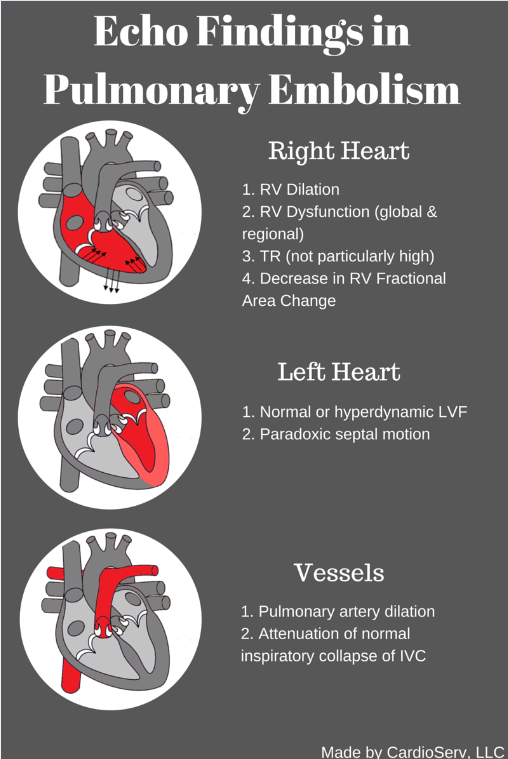 RV is an important barometer to what is happening in the pulmonary arteries and on the left side of the heart. In a pulmonary embolus, there is an acute rise in pulmonary resistance. The pulmonary pressures DO NOT go up acutely. It is a common misconception that they do. The increase in pulmonary vascular resistance results in increased RV afterload and increased RV wall tension. The RV dilates acutely and can become dysfunctional. Reduced cardiac output leads to reduction in LV output and ultimately hypotension. Depending on the size of PE, this can result in right ventricular failure. 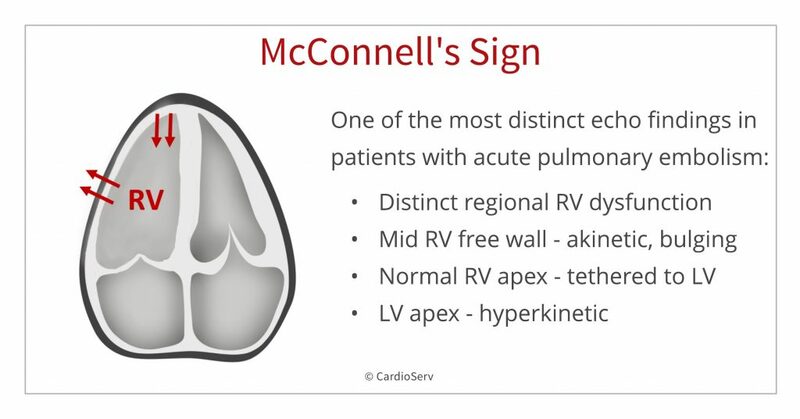 McConnell’s sign is one of the most distinct echocardiographic findings in patients with acute pulmonary embolism. The sudden pressure overload on the RV also causes increased wall stress. As a result, it is left mechanically stunned. The right ventricle has a complex shape: distribution of this stress is not uniform, there is mid right ventricle free wall bulging and localized ischemia of free wall due to increased stress. The apical section of the RV is not exposed to this stress due to its location next to the LV. RV apex is anatomically tethered with LV apex. The LV is usually hyperkinetic due to tachycardia and this pulls the RV apex along with it for a proxy contraction. Remember that pulmonary resistance, not pressure, elevates during a pulmonary embolism. Therefore, TR velocities are not particularly high in an acute PE. Velocity between 2.5-3.0 m/s maybe normal for an acute PE assuming the right heart is not accustomed to high pressures previously. What is the echo 60/60 sign used to help rule-in pulmonary embolus? We will write about the 60/60 sign in next week’s blog! 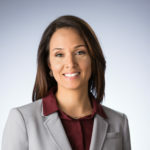 In the July, 2017 issue of JASE, there was an article published that represented “one of the most thorough meta-analysis of transthoracic echocardiography for pulmonary embolism to date and confirms a moderate sensitivity and high specificity across multiple echocardiographic parameters” (JASE, 2017, Vol 30). The findings demonstrated how “echo should not be used alone as a test to rule out pulmonary embolism” but due to the high specificity, echo is adequate as “a rule-in test at the bedside in critical care settings” (JASE). This is not necessarily new information, but it was the first study to comb through all the published articles to date to review the findings and help clarify the role of echo in the setting of pulmonary embolus. 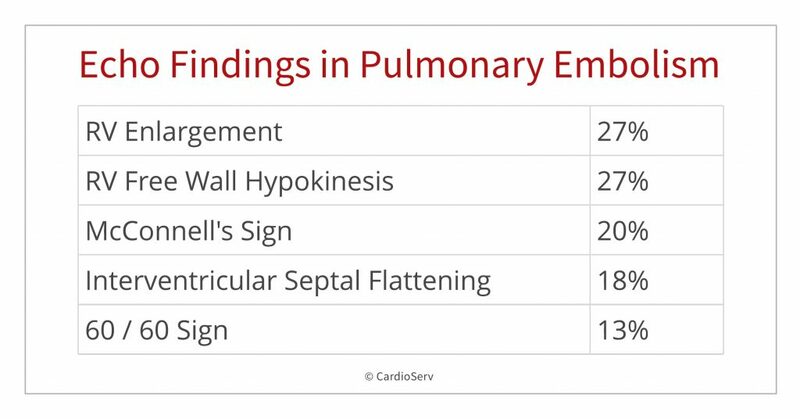 Below is a great demonstration of McConnell’s Sign in a case study of a patient with pulmonary embolus presented by MGH Ultrasound. Its only 2 minutes and worth watching to better appreciate the echo presentation of McConnell’s Sign! Echocardiography can be useful for ruling-in a Pulmonary embolism, but should not be the main test for ruling out a pulmonary embolism. Echo findings include McConnell’s Sign, enlarged RV, IVS flattening and the 60/60 sign. Next week we will explain the 60/60 sign. Special thanks to Dr. Scott Solomon, Professor of Medicine at Harvard Medical School for your awesome Illustrative Case Presentation at the 2012 ASE Scientific Sessions – your presentation really helped explain and demonstrate pulmonary embolism in echocardiography! Thanks for great information about echo findings in PE!!! what about TAPSE? it's can be represented as RV dysfunction. so, Could it be used in the diagnosis of PE? What we have found working for many years on the topic is very similar to what you have shown - echo in general (TTE, CUS, LUS) can be used as rule in, but not rule out, for the simple reason that small low risk pulmonary embolism without DVT and subpleural consolidations and without any RV pressure overload, cannot really be caught by even multimodality echo. We have found that the most simple of tests - CUS (compression ultrasound) works very well in the setting of suspected pulmonary embolism and allows us to reach diagnosis in minutes in about 50% of our general cohorts. The worse the patient and the more massive the pulmonary embolism - more DVTs we found, in some high risk cohorts up to 80%. Thus, we suggest addition of CUS to the US imaging in patients with suspected pulmonary embolism. Thanks for the post. Is it possible to have relatively normal TAPSE while exhibiting McConnell sign?